Last month the Permanent Court of Arbitration rejected Australia’s claim it had no jurisdiction to conciliate the dispute in the Timor Sea. This means Australia must come to the table and negotiate with East Timor. But Foreign Minister Julie Bishop has been quick to note that Australia will not be bound by the international panel’s outcome. At the end of the day, Timor’s deal will still come down to what the Australian government thinks they can get away with. Under the UN International Law of the Sea, all the areas presently being drilled are in East Timor’s half of the Sea. The reason successive Australian governments have forced East Timor, the poorest nation in our region, to defer making a decision on the maritime boundary for 50 years is precisely because they know that Australia’s position is untenable under international law and the UN Law of the Sea. This would very quickly become apparent if the decision was decided by an independent international authority. The treaty on “Certain Maritime Arrangements in the Timor Sea” (CMATS) was signed in 2006 between the Howard government and the government of Timor-Leste (East Timor). The negotiations had been tense over the years. Prime Minister Mari Alkatiri and the ruling Fretilin party were opposed to the maritime boundary between the two countries not being drawn half-way between them but closer to Timor-Leste along the seabed limits of the continental shelf. The theft had been agreed between the Hawke Labor government and Indonesia’s Suharto dictatorship with a treaty in 1989 and the boundary was a major factor in Australia’s hypocritical, indulgent stance towards Indonesia’s invasion of East Timor in 1975 (see below). In 2004, the then Howard government Foreign Affairs Minister Alexander Downer promised to give Alkatiri a “lesson in politics” for his pursuit of his struggling country’s interests. It would get royalties from a Joint Petroleum Development Area and that’s it. Alkatiri would soon be removed from office in coup-like circumstances. The Howard government refused international arbitration on the maritime boundary. The Australian public knew about the humiliation of Timor-Leste’s representatives in 2004 but it would not have been aware that Australian spies had bugged government offices in Timor-Leste so that Howard’s negotiators would have the drop on their local counterparts. Some years later, a veteran spy told Canberra lawyer Bernard Collaery about the shameful operation he had been involved in. Collaery was acting for the government of Timor-Leste at the International Court of justice in The Hague. The Timorese want the current treaty scrapped and a new one drawn up. They insist the negotiations that led to CMATS were not entered into in good faith by Australia, a fact confirmed by the whistle-blower’s revelations. But rather than move to repair damaged relations, the Abbott government turned on Collaery and “Witness K” – the remorseful former ASIS agent – and the government of Timor-Leste. ASIO raided the lawyer’s Canberra office and seized large numbers of files. Witness K has had his passport confiscated to prevent him giving evidence on the matter at The Hague. They could both be slapped with criminal charges. Attorney-General George Brandis insisted the heavy-handed actions were in the oft-cited “national interest”. But they are ultimately in the interest of oil and gas companies (such as generous Liberal Party donor Woodside Petroleum). “Woodside is a huge Australian company and they were proposing to invest billions of dollars in Greater Sunrise [oil and gas field] to create wealth, which would inter alia have been wealth for Australians, but obviously substantially for the East Timorese as well. So I was all in favour of that. I was all in favour of it,” Alexander Downer told Marian Wilkinson of the ABC’s Four Corners program. Australian security agencies spy on their own citizens and they help the US, UK and others to do so, too. The “five eyes” – the intelligence networks belonging to the US, UK, Canada, Australia and New Zealand – help each other to keep tabs on individuals, groups, political, military and other developments of interest across the globe. Australia is a junior member of this club and most people realise its basic purpose is to serve US strategic interests, especially in the Asia-Pacific region. Despite this “deputy-sheriff” status, Australia has considerable spooking capacity of its own and, puts this at the service of transnationals operating in Australia. Nothing is allowed to get in the way of the “national interest”; not even if it means cheating one the world’s poorest nations out of much of its potential oil and gas revenues. 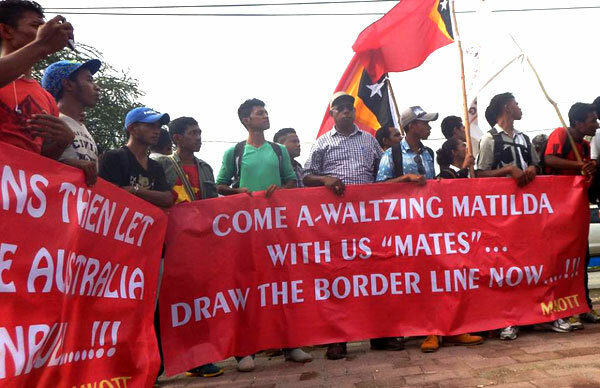 No-one from the government’s ranks would comment on the spying allegations but there is plenty of ominous talk about grave consequences for Timor-Leste if it persists with its legal challenge to CMATS. The Abbott government was fuming on investors’ behalf that Timor-Leste stood up for a pipeline to allow processing of offshore resources on its territory rather than aboard a floating plant. At the same time, Australia poses as a friend and generous benefactor to our northern neighbour. Peter Galbraith, head negotiator for Timor-Leste in 2004, was not fooled. His reaction to the spying revelations says it all about Australia’s deteriorating reputation in the region. “You know, it’s hard to imagine that would really be done by a friendly government and especially for what were essentially commercial negotiations. That really seems there wasn’t a national security issue here for Australia. It wasn’t as if, you know, the Timorese were posing some kind of military threat or hatching some kind of plot. This was really bugging for commercial advantage,” he told Four Corners. At issue in the maritime border dispute are royalties estimated at between $10 billion and $20 billion over the next 30 years. Australia has sucked in over $2.1 billion from royalties on the oil and gas in question since 1999. With its fair share of these funds, East Timor could meet the needs of its people and build some financial security. Without it, as Oxfam’s policy director James Ensor pointed out, the country runs the risk of joining the ranks of “failed states” in the region. The current dispute has its origins in Australia’s relations with and support for the brutal Suharto dictatorship in Indonesia (see page 4). In 1972, Australia obtained an agreement from Indonesia that the end of the continental shelf to our north west would be the boundary between Australia and Timor even though the border is only 60 kilometres from the coast of East Timor. On the eve of Indonesia’s invasion in 1975, Australia’s then ambassador in Jakarta, Richard Woolcroft, advised the Whitlam government that Indonesia would be easier to deal with over the natural resources in the Timor Sea than the government of the newly-independent, former Portuguese colony of East Timor. Australia stood by and 24 years of genocidal occupation by Indonesia’s military followed. In 1989 Foreign Minister in the Hawke Labor government Gareth Evans and Indonesian Foreign Minister Ali Alitas toasted a deal to share out the oil and gas resources off the coast of Timor from the comfort of a jet flying high above the stolen territory. In 2002, the Australian government withdrew from UN Convention of the Law of the Sea (UNCLOS) negotiations in the International Court of Justice. In circumstances like those involving Australia and East Timor, UNCLOS lays down that the border of the states should be the median line drawn halfway between them. Such an arrangement would see East Timor in charge of 90 percent of the Sea’s oil and gas. As it stands, it gets 90 percent of the royalties from the Bayu Undan field within the Joint Petroleum Development Area (JPDA) described in the Timor Sea Treaty of 2002. However, the largest fields by far – Laminaria and Greater Sunrise – are located outside the JPDA and from these East Timor will only get 20 percent of the royalties on the Greater Sunrise gas field. It should be noted that the Laminaria field is totally within East Timor’s half of the Timor Sea as are most of the Sunrise and Troubador fields. East Timor has refused to ratify the Timor Sea Treaty. It wants Australia to return to the jurisdiction of the International Court of Justice and UNCLOS for the adjudication of the maritime boundary. It wants the royalties from the fields outside the JPDA to be held in trust (escrow) until the dispute is finalised.